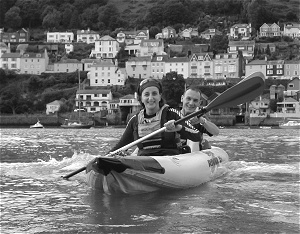 Spend quite a bit of the time out on our 2-man kayak here in Devon. Caught 85 bus to Teignmouth on Sun 21 August 2005 with the boat & paddled back to our local beach, Oddicombe in Torquay. Here's 3 little video clips of our trip: 1/ early on when it was calm; 2/ a little later with a force 2 wind; 3/ as we passed Mackerel Cove wind was force 4 with a bit of a swell before settling down again as we approached home. (click links to play! ).